For our Expert Q&A on Thursday, May 16 we had Tim and Mark from the Trove team to answer your questions on using Trove for family history research. Thanks again to Tim and Mark for all their valuable advice and tips. When: NSW – ACT – VIC – TAS: 8:30-9:30pm AEDT | QLD: 7:30-8:30pm | WA: 5:30-6:30pm | NT: 7:00-8:00pm | SA: 8:00-9:00pm | Weekly on Thursdays nights! Please find the transcript of the Q&A and links below. Our Expert Q&A with the Trove team starts in 10 minutes at 8:30pm AEST. 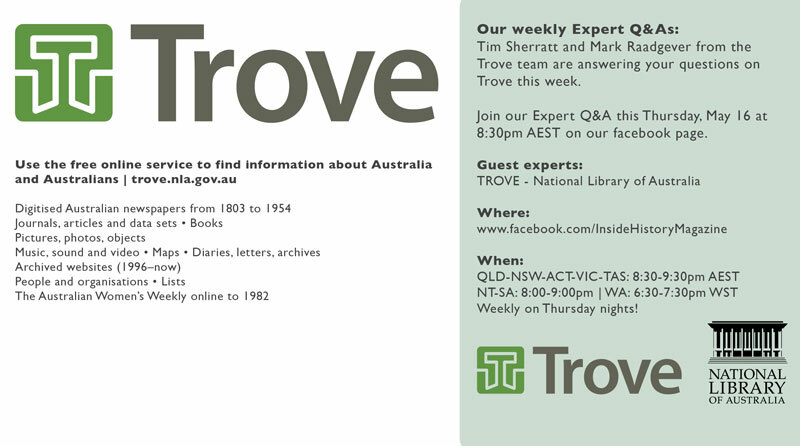 Join us with your Trove questions! Please ask your questions in a comment below, and Tim or Mark will answer in a following comment. Comment: IHM: Welcome everyone, thanks for joining us. Please welcome Tim and Mark to tonight’s Q&A! A. IHM: Tip :: Keep refreshing your browser to see the answers as they appear and remember to look through the entire list of comments, as Facebook may order your questions and answers out of sequence. Q. From Bindi: Hi Trove. Can you please help me find anything about death of my G G grandfather? I’ve just found out he died in 1885. SA. Thomas Johns. His birth year 1848 in Cornwall. A. Mark: Hi Bindi – best thing to do is just go into Trove and do a search for him as the newspapers are indexed in full text. A. Tim: Hi Bindi. The digitised newspapers in Trove are a great source of information for family history. Have you tried searching for a death notice? Q. From Ros: Are there plans to put any of the Terang, Victoria newspapers on? Also I really appreciate the email notification system. It’s extremely convenient and I am a frequent user. A. Linda: Love that e-mail notification system – just realised it is there. A. Ros: Hmm seems there are library gremlins about if Trove is down. A. Ros: Will do Mark but I do have to say I would not have progressed as far as I have with my family history if it were not for Trove. I use it all the time for a huge variety of reasons but mainly family history and local history but I also use it a lot for displays at my little library. A. IHM: Did you break it Linda 😉 Isn’t it always the way! A. Linda: I have only ever had it go bung on me once. Once in how many years??? I seem to remember it was for a couple of days, and people nationwide were having withdrawal symptoms. A. Mark: Hi Linda – although Trove has just gone down, I can answer the question. The reason that you sometimes get articles with a very poor image (like the one you’ve linked to), but the text seems almost perfect is because the images you see in Trove are not necessarily the same ones that were OCRd – the images in Trove are greyscale, whereas the images sent to OCR are bitonal, and the images in Trove go through a few automated enhancements before being displayed. Unfortunately these are applied across the entire page, so where some areas of the page have good contrast and others have poor contrast (which is the case with this page) we sometimes end up with a less than ideal image. A. Linda: I knew there had to be logic to it, somewhere. Thank you! Q. From Marg: Hi guys when I have been researching family history via Trove e.g. newspaper articles I can only find things through the Maitland Mercury NSW. The paper that I am trying to find out info from is the Northern Chronicle for the Taree region and my g.g. grandfather James Levick around the year of 1905. Could you point me in some direction please. A. Ros: True and having The Land and The Catholic Press on are a huge help for those researching the Riverina. I now have a photo of a great uncle which I would not have as the family photo albums have been lost. Comment: Leane: Thankyou Trove for helping solve quite a few mysteries over the years. A. IHM: We always start our research with Trove! Q. From Brigid: Hi Tim and Mark, I use Trove a lot on my work laptop, but have just tried it tonight on my Android tablet (Nexus 7). It’s not the easiest… Any tips, or plans to make a small tablet-friendly version for editing text on the newspapers? A. Tim: Brigid, yes there’s currently a project underway to redevelop the newspapers zone in Trove. This will include an improved mobile experience. A. Brigid: Excellent, thanks Tim. I’m sure it’s going to be challenging to develop, but so necessary now with the massive increase in mobile and tablet usage. Comment: Vicki: Hi everyone, Trove as been my best friend. I have found newspaper articles that have given me some good clues as to where to search next. A. Mark: Glad to hear that you’ve been getting so much pleasure out of using Trove and that it has helped you with working out where to search next. Q. From Sharon: I would like to find out more about assisting with indexing. A. Mark: Hi Sharon – Presuming that you are referring to text correction? If so, then it is on a completely volunteer basis, and we don’t provide any specific guide on which articles to correct, preferring users to correct items they are interested in. There are some guidelines available on the Trove forums at http://trove.nla.gov.au/forum/showthread.php?83-Australian-Newspaper-text-correction-guidelines that can help you with getting started, and getting more advanced. A. Sharon: I already assist with test correction but I was thinking that perhaps I could assist with scanning local papers or something? A. Mark: Hi Sharon – newspapers in Trove all come in through the Australian Newspapers Digitisation Program, which is a mass digitisation project scanning to specific criteria. Generally it is not possible to take in files from external sources, however information can be found on the ANDP website at http://www.nla.gov.au/content/newspaper-digitisation-program if you wanted to investigate. Comment: Tim: Yes folks, Trove has decided to show the new manager who’s boss by playing up for us just as we’re trying to answer your questions. Apologies all for the inconvenience! Q. From Dulcie: I can’t log-on from my phone to check – keeps refreshing to log-in page again. Can you confirm if articles in a list can be sorted by dates? If memory serves me right, they are currently in the order you add the article to the list? Q. From Leane: What is the earliest Newspapers you have available? A. Tim: Hi Leane. The first digitised newspaper in Trove is from 5 March 1803! Q(b): Leane: Would that be Sydney or Hobart? A. Leane: Thanks I’ll check that one out, might find that family arrival yet. Q. From Brigid: Have you ever thought of setting up a Trove Users Anonymous group to assist people like me who are hopelessly addicted to correcting ocr text? A. Mark: Hi Brigid – you can always set one up in the Trove forums if you wanted to…. A. Tim: If text correction is an addiction, I’m not sure what that makes us…? A. IHM: My name is Cassie Mercer and I’m a Troveaholic. A. Linda: Hi Brigid – I thought that was what the forums were for! I like the “Amusingly mistranslated text” one best. My best find was a bloke in a meeting “waving his fish around his head”, instead of his fist! A. Brigid: I would set up a Troveaholic group… But I can’t seem to find the time! A. IHM: Lol, busy on Trove are you! A. Linda: Hmmm – what would be the collective noun for a group of text correctors? A. Carmel: When I recommend Trove I always tell people to set the day aside as it is addictive. I always seem to find really good stuff as I am about to go to bed! A. IHM: A Troop or Coalition of Troveites or Troveaholics? A. Linda: A Type of Textaholics??? A. Linda: Aaaaah! A TROVE of Textaholics!!! It is always the obvious one that you miss. Q. From Kerry: I was just wondering is there many newspapers to go to be digitized and how does one get a job in this field as I am keen to work in this field? A. Mark: Hi Kerry – there are over 7000 newspaper titles that have been identified as eligible for digitisation (of which 441 have been done so far), so there are quite a lot of newspapers left to go. A. Kerry: Trove helped me track the family of WW1 medals giving me the name of Hugh Hunters daughters. Without that link I would never have found his daughter now 80 to return these medals home. So Ty Trove. A. Tim: Linda, thanks for your fantastic initiative, it’s great to see people helping out in this way. I’m not sure whether we can create a formalised crowd-funding program, but it’s certainly something worth looking into. A. Mark: Linda – with the crowd funding this is something that is being investigated by the section of the National Library that does this type of work.